Throwing a Halloween party? 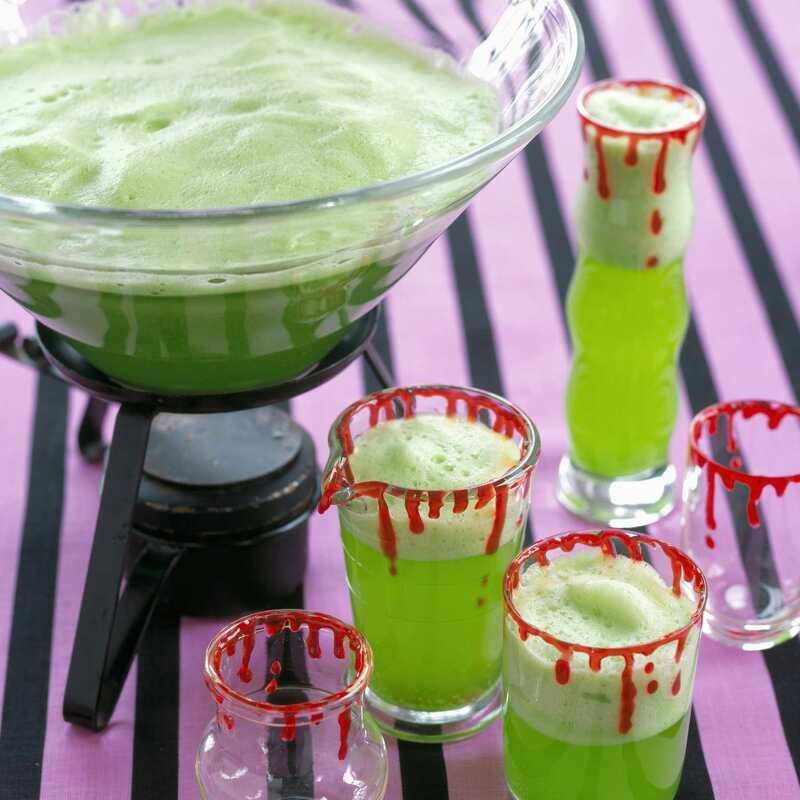 Whip up these spook-tacular treats and drinks to make any party gruesomely great. A non-alcoholic Monster Punch is an addictively delicious drink that everyone of all ages can sip on. Using lime sherbet and frozen juice concentrates, you can also add green food coloring to enhance the emerald hue of the party mocktail. Sparkling ginger ale also reacts with the cold sherbet to create a bubbling "witches cauldron" that's the perfect finishing touch. These mummy dogs make a perfect Halloween recipe for kids—they can even make these easy-to-prepare snack themselves. All you need is packaged crescent roll dough and hot dogs to create a filling hand-held meal for Halloween trick-or-treating. Serve this bloody-good sangria as a self-serve punch your guests will love. Easy to prepare ahead of time, the really fun part of this red drink is customizing it with your own creativity. Hang some gummy worms on the side of the punch bowl, float edible eyeballs in the liquid, or freeze all kinds of creepy crawlies in ice to float inside. The only limit is your imagination! Deviled eggs are a favorite party appetizer and this spooky spin makes an eye-catching starter or snack on Halloween night. You can play with this versatile recipe to suit the tastes of your kids or party guests. Green food coloring makes the eyeballs a ghoulish green, studded with black olives for the pupils. Thinly sliced pimientos, roasted red bell pepper, or bits of paprika create a frightful, bloodshot eyes effect. These little sandwiches are so cute your kids will gobble them up. Meatballs are simmered in hearty spaghetti sauce and topped with olives so they look just like eyeballs peeking out from toasted rolls. Use frozen pre-cooked meatballs to make this recipe an absolute snap to prepare. You could also add some cooked and pureed vegetables to the sauce to sneak a little more nutrition. Green guacamole makes a great Halloween party appetizer when you call it "Guacamoldy." Serve the classic dip with tortilla chips as a great addition to any buffet table. What could be a creepier Halloween party dish than broiled "bat" wings that are smothered in a tangy barbecue sauce? Bat wings (psst, they're actually chicken wings) make a great family meal Halloween night or party snack. You can easily double or triple this recipe to serve a big crowd. Feel free to use your own favorite bottled barbecue sauce to make these wings quick and easy to prepare. Halloween night is often a chilly affair. Warm kids' tummies before they go out into the night for trick-or-treating with a rich and creamy pumpkin soup. The recipe makes use of pantry ingredients like canned pumpkin, frozen corn, chicken broth and cream. You can also dress it up quickly for grown-up Halloween parties by garnishing it with some roasted corn kernels and Parmesan cheese. Here's a Halloween mocktail with an extra special twist—the mysterious ingredient in the punch may be the ground ginger in the apple juice... or the creepy, realistic frozen hand! Grown ups will get a kick out of this jiggly Halloween shot. Delight adult guests with a combination of orange Jell-O, creamy coconut milk, and Cointreau liqueur. They're a fun addition for Halloween parties or any occasion where pint-sized, spiked oranges may add to the festivities. Bubble, boil, toil and trouble... serve this chunky "Witch's Stew" in a cauldron for a fantastic centerpiece that adds something spooky and spicy to any Halloween party buffet! What you'll actually be serving your guests is a vegetarian Thai green curry filled with aromatic spices and herbs. Pumpkin pasties are a favorite treat of Harry Potter, which he originally encountered aboard the Hogwarts Express on his way to school for the first time. These bite-sized pumpkin treats are spiced up with curry powder and baked until golden and crispy. Everyone from the littlest goblin to oldest wizard will love these creepy treats, ready in just 15 minutes. The four-ingredient "fingers" make the perfect sweet-and-salty snack for a kids' Halloween party or grown-up shindig. How spooky can you get? For an adults-only Halloween bash, wow guests with a spook-tacular cocktail featuring a gruesome garnish. Eerily impressive, this vodka martini has a beautiful pale blue color and is sweetened with lychee liqueur. Create the edible eyeball topper with the simple step-by-step instructions featured in the recipe. Three ingredients and 10 minutes is all it takes to prepare a batch of pretzel pumpkins. Since they're so fast to make, it's easy to whip up a few trays for a party or a scary movie night with your grown-up friends. Make no bones about it, these caramel apples are a frightfully delicious. Apples are already a great seasonal treat since they're at peak sweetness during the fall months. Dunk them in caramel and white chocolate, then decorate them with a creepy skull design and they're dressed up for Halloween, too. Creepy-looking spiderweb cookies are a sweet and scary chocolate treat. 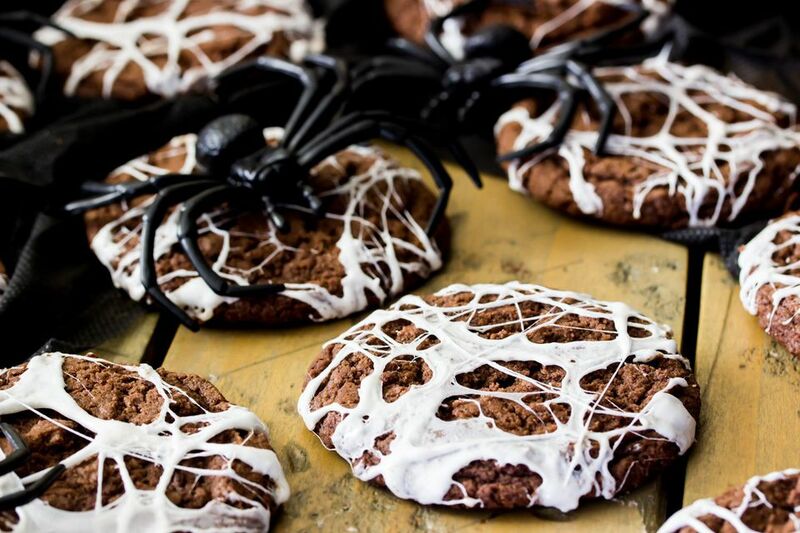 The spiderwebs that make these cookies seem so frightful are actually mini marshmallows that have been melted and stretched over the baked and cooled cookies. It's a simple technique with a big effect. This Halloween recipe is a delightfully spooky treat that kids will love. The simple dessert bars have just a few ingredients, but look much more complicated to make—all you have to do is cover chocolate bars with an edible white skeleton and lots of cookie crumb "dirt." These adorable ghost strawberries are scarily simple. Instead of dipping strawberries in the traditional semi-sweet chocolate, you dunk them in melted white chocolate and add ghostly "faces" using bits of dark chocolate. They're a sweet addition to any grown-up Halloween menu and also simple enough for kids to help you make. Here's a gruesomely elegant cocktail that's suitable for adult Halloween parties and easy to mix-up for guests. Fine Kentucky bourbon combines with elderflower liqueur, spicy ginger beer and Angostura bitters for a Halloween cocktail that's frightfully good. The blood-red liquid in the drink floats on top of the cocktail in an eerie fashion, giving it a bloody look that's perfect for a scary celebration.